The movie Alex Cross is now out in theaters, as those who have an interest in James Patterson novels and adaptations are probably well aware. The film stars Tyler Perry as the titular character, along with Matthew Fox from Lost in the role of the villain. While many fans were quite excited about the movie when they heard about it, some did have some reservations about Perry in the lead role. 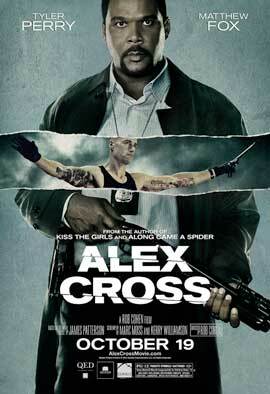 Two other films, Kiss the Girls and Along Came a Spider, featured the character of Alex Cross. In those films, Morgan Freeman portrayed the character of Cross. There was a fear that Perry would not be able to bring that same gravitas to the character. What are People and Critics Saying? According to many critics and fans of the character, Perry just did not pull off the character. For those who do not know, Cross is a forensic psychologist who works with the police department – sometimes as a detective and sometimes as a consultant depending on the novel. Many say that Perry was unable to pull it off, and that he seemed uncomfortable out of his own environment. You may know that Tyler Perry is a writer, director, and producer in his own right, and he has many successful properties. He rarely ventures outside of that comfort zone, though, which may be one of the issues that plagued the film. However, it’s difficult to lay blame all at Perry’s feet. One of the big issues that some people actually had with the film was the fact that it was not based on any of Patterson’s many novels about Cross. They cite a poor screenplay. After all, the screenplay is where the story originates, and many say that’s where the problems begin. The film just doesn’t match the same pace or sense of style that the Cross novels have. Perhaps some fans were too quick to judge or they were hoping for an adaptation of a novel. Many are disappointed that their favorite forensic psychologist just isn’t getting the treatment that he deserves. Others believe that the direction, and even the production values, could have been higher. They believe that some of the scenes looked rushed and could have benefited from more polish. Of course, in these cases, one also has to consider the vision of the director. Something that most of the critics seem to agree up on though is that Fox gave quite a compelling portrayal as the psychopath that Alex Cross must face and defeat. One look at Fox in this movie is enough to show you that he put in quite a bit of dedication to the role. He has a lean, mean physical appearance, having dropped weight to play the bad guy here. The maniacal look on his face helps to solidify his role. The teasers to the film promise a lot. They call it a “cat and mouse game” between Cross and the serial killer Picasso, where Cross’s psychological limits and breaking point are tested. However, it does not quite live up to that hype, which is a shame because so many were looking forward to the film. A film that uses someone with a forensic psychology degree working against a killer is not new. When done correctly, it can ratchet up the suspense a great degree. This just didn’t follow through on the promises. With a budget of $35 million and only bringing about a third of that back to the studio thus far, we may not get to see a sequel that stars one of the most well known, fictional forensic psychologists and detectives in the world, and that would be a real shame. Anita Schepers provides advice and information on getting a degree in forensic psychology online at ForensicPsychologyOnline.com.